As the oldest children in Key Stage 1, we try very hard to set a good example to the younger children. 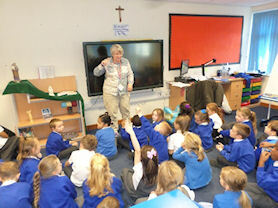 We are a busy class where lots of creative and fun learning takes place. We are always encouraged to be happy, work hard and treat each other with kindness. Each day we study Mathematics and English (speaking and listening, reading, writing and phonics). We also study RE, Science, Computing, Physical Education, Art, Design Technology, Geography, History, Music and Singing, Personal, Social, Health, and Citizenship Education. 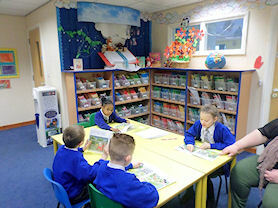 We have a bright classroom with lots of displays which motivate us to work hard. Our prayer table is an important focus in our classroom and we change it throughout the year to celebrate Feast days and special times in the Church's year. Our prayer table reminds us that Jesus is always present and we try hard to follow in Jesus' footsteps. Our Catholic Faith is very important to us and we strive to ensure that we live out our Mission Statement to the best of our ability every day. In our classroom, we have a special prayer focus area that we use to celebrate our faith. Tuesday Mass is held in Church. In addition to regular participation at Mass, together with services at Church, we are given the opportunity to conduct and lead our own prayer services for our class. Parents are always welcome to attend school and class Masses. 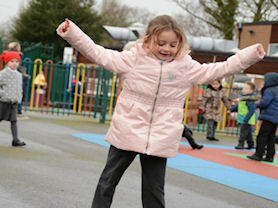 The playground is a happy place. 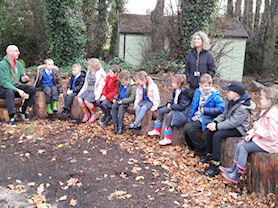 Learning in a different way by being outside and using nature… out and about at Forest School. 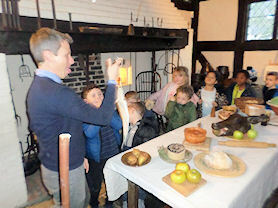 A visit to Selly Manor to learn about the Great Fire of London.